Absinthe owes much of its allure to the preparation of the drink. It takes a steady hand and a cool demeanor to pour the perfect glass, but don’t let that intimidate you. Armed with the proper tools and ingredients, you too can enjoy “The Green Lady” just as they did in the cafes of old Paris. A bottle of your favorite absinthe, of course. If you don’t yet have a favorite, take a chance on one of many of the authentic or newer brands available. The Pontarlier glass – named for the French town, home to the first absinthe distillery – is recommended due to the special bubble or “well” reserve at the bottom of the glass which indicates exactly how much absinthe is needed. The well at the bottom of a Pontarlier glass indicates a perfect pour, but absinthe can be enjoyed just as well out of a paper cup if necessary. We highly recommend you use a traditional absinthe spoon for your absinthe pour. You’ll see why when we go through the process of the traditional absinthe ritual. However, just as absinthe can be prepared in any kind of cup, so too can it be prepared using any kind of filleted or fork-like utensil. A spork won’t nostalgically transport you to the benches of the Moulin Rouge, but it’ll get the job done. A decanter of pure ice cold water (or Absinthe Fountain). The traditional absinthe recipe calls for 3 parts water to 1 part absinthe. Sugar cubes. Organic sugar cubes are often recommended as they are less compact and are more easily dissolved in water. All you really need to know about serving and enjoying absinthe can be summed up in a fraction, and the ratio will depend on your taste. We recommend three (3) parts water to one (1) part absinthe, so a 30ml shot of absinthe will be mixed with 90ml of water. However, you can experiment with this recipe and add or subtract water to your taste;. Sugar is a good addition for any absinthe blend, generally one (1) teaspoon per mixed absinthe drink. 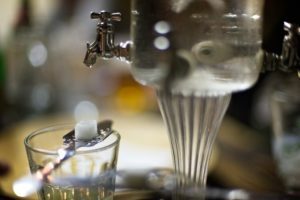 With this math and the right ingredients, you can make an absinthe ritual of your own, or blend a simple drink whenever you like. .
Glass of absinthe and dripping fountain. Whether you are entertaining guests or sipping by yourself, the classic French absinthe preparation is a treat to prepare and enjoy. For an authentic look and feel, absinthe spoon and pontparlier glasses are recommended, but there are plenty of modern absinthe utensils and stemware available to give your absinthe preparation a contemporary touch. When you sit down to your first pour of absinthe, your first step should be to take a deep breath and clear your head. This step is often overlooked, yet we feel it is an important one. Your enjoyment of absinthe will increase ten-fold if you are calm and relaxed going in. Once your mind and body are at ease, move on to the pour. A 30ml shot of absinthe goes in to your glass – if you are using a Pontarlier absinthe glass, fill the bottom reservoir “well” or “bubble” to the tapered middle dose line, but be careful not to overflow. You’ll have proper emerald absinthe enchantment awaiting you for the next step. Take a whiff off the top of your glass and move on. 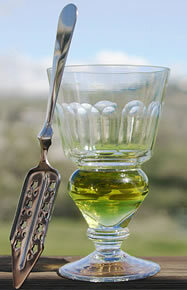 An absinthe spoon has fork-like stems surrounded by openings and the spoon “bowl” for the appropriate pour from here on out. You will place a sugar cube on the spoon, and set the spoon’s bowl to rest atop the absinthe glass. With extreme care, slowly pour ice cold water over the sugar cube and into the glass, where the water and absinthe will combine into a milky blend, or louche. Louche is the French word for opaque, and it is caused by certain ingredients in the absinthe (especially fennel) reacting to water. The cloudy louche is a good thing, and you’ll notice the bouquet of aromas blissfully gliding out of your glass. The last step in the absinthe ritual is the easiest. Lose yourself in the louche, savor your sip, and enjoy (responsibly). The classic French absinthe pour isn’t the only way to enjoy absinthe. There are many other ways to prepare The Green Lady, and experimenting with these different pours, as well as coming up with your own, is a treat unto itself. When performing a non-traditional absinthe pour, always keep in mind the ratio of three (3) parts water to 1 part absinthe. 3:1 is the “golden ratio” of absinthe drinkers, but feel free to experiment even with this formula. the Czech or Neue Bohemian absinthe pour is a spectacle to behold. This pour is similar in every way to the classic French style absinthe pour, with a significant exception. Before you place the sugar cube on the absinthe spoon (or spork, depending on your taste and availability of the utensil), dip the sugar cube into the absinthe in your glass. Absinthe is an extremely potent alcohol, and as such it is also extremely flammable. After you’ve dipped the sugar cube, place the absinthe-soaked sugar cube back onto the spoon and carefully set it alight with a match or cigarette lighter. Use tremendous care and caution in this step of the process. Once your sugar cube is lit, allow the sugar to burn for a few moments and caramelize. Any absinthe present on the spoon will also ignite. Dip the flaming spoon into the absinthe, which will start a controlled burn within your absinthe glass. Take care to prevent any splashing or spills. When you are ready, slowly, carefully pour ice cold water into the flaming absinthe, which will extinguish the fire and create a louche within the glass. This preparation process is a showy one, but should also be performed carefully and responsibly. Glass-in-a-glass, or the louche waterfall. Another method of mixing water and absinthe is displacement. Using a small shot glass and a larger drinking glass (either a bulbous wine glass or a rocks glass), you can create a louche effect with your absinthe by creating a small fountain. Place the empty shot glass inside an empty drinking glass. Fill the shot glass with about 30ml of absinthe. With or without a sugar, pour ice cold water over the absinthe in the shot glass. The louche will spill over the sides of the shot glass and fill up the drinking glass. Complete the pour until the shot glass contains only water, then remove the shot glass from the full blend in the larger glass. A steady hand and a slow pour are necessary for the dazzling “louche waterfall” effect. Voila, a brilliant absinthe blend that is not only unique, but requires just two glasses you likely already have stocked in order to perform. Absinthe neat (and not neat). Drinking absinthe doesn’t need to be an exercise in restraint and preparation, though we prefer it that way. You can also drink absinthe “neat” or straight. Connoisseurs of absinthe recommend tasting vintage absinthes straight in order to get a feel for the complexities of the liquor, but no more than a half of a normal absinthe shot should be tasted at a time due to the incredibly high alcohol content in the drink. Absinthe can also be used as a key or supplemental ingredient in other cocktails, such as the racy Absinthe Frappé: a large shot of absinthe in a highball glass filled with crushed ice, shaken up with a spoonful of sugar or simple syrup.